Once in a great while, a brand new artist comes along and drops a stunning release on the world, seemingly out of the blue. 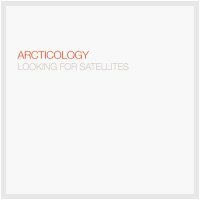 Dale Humphries, who releases ambient music of staggering beauty and depth under the name Arcticology, is such an artist, and his seminal debut album entitled Looking For Satellites is such a release. Folks, we at Earth Mantra listen to a lot of ambient music and are always on the lookout for new artists that we were not aware of before, but it is a rare event indeed when we come across a release by a brand new artist that blows us away the way this album did. Put bluntly, this is by far the best new ambient artist we have heard in a long time, and it is our distinct pleasure to welcome this magnificent artist to our humble little netlabel. We could try to describe the music using lots of flowery poetic language, but we would ultimately fail because the music is simply beyond words. Suffice it to say this album is deep on a pelagic scale but simultaneously beautiful in a delicate and detailed way that withstands even the most exacting scrutiny. A masterwork by any measure, we are proud to bring you this eloquent and profound album on Earth Mantra. All Earth Mantra releases are available under the Creative Commons Attribution - NonCommercial - NoDerivs 3.0 Unported license. For commercial use, please contact us.